Bismillah. I spoke to Amanda Lindhout on Sunday . She mentioned: people walking for 40 days in the heat to the camp in Kenya, many dying along the way; a mum whose 3 kids had died on the way; mums holding their dead babies. Our goal is to raise $300,000 USD by Saturday July 30th which will feed 50,000 starving Somalis inside of Somalia. Food distribution will take place in Dhoobley, Somalia and will target those fleeing the country on foot. Many of these people die of starvation before making it across the Kenyan border into the refugee camps. Our food baskets will feed a family of 5 for two weeks, giving them sustenance to complete the multi-week journey and settle in the camps. All implementing organizations on the ground are working with 0% overhead. Anyone requiring a tax receipt will be charged a 17% administrative charge by Hope For The Nations, our American based partner issuing the receipts within North America. Compared to the 40%overhead costs of Unicef, the only other organization doing food distribution, our convoy is the best option for maximizing donor impact. I believe it is our responsibility as compassionate citizens of the world to do whatever we can to save the lives of those suffering in Somalia. It is a tragedy when mothers are burying their children because of lack of food. If nothing else people should know that with every donation they give- lives are saved. This is something that is understood on the streets, but often not by law-enforcement or government. In London, every borough police commander I’ve ever asked has told me that gangs and drugs are the biggest issues for them. Let’s hope that the UK police forces and government departments, local and national, can do some joined-up thinking around these matters and address the problems more holistically. I thought you might like to know the outcome of Hasan’s appeal today, and I hope it will give you encouragement to persevere in the face of all odds. and the other victims, but I hope it will mean that in future UN Protection will in fact mean that. who claim their male relatives should have been protected by the Dutch U.N. It could also have wider implications for countries sending troops on U.N.
taken to court for the actions of their troops even when they are under U.N.
argued that all three men should have been protected by Dutch peacekeepers. father and brother were not. worst massacre since World War II. 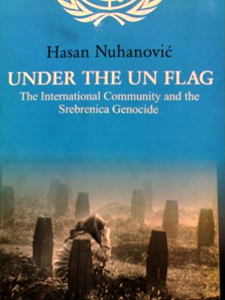 The victims were among thousands of Muslims who took shelter in the U.N.
Bosnian war that claimed 100,000 lives. Mladic’s troops and forced thousands of Muslim families out of the compound. boys out of their compound. before deciding whether to appeal. “This was never about money for the victims,” Zegveld said. rejected any Dutch government responsibility. “I am after the killers of my family, the Serbs who live in Bosnia,” he said. commanders’ call for air support. in the case, it would likely give hope to others. stand a good chance to win their case as well,” she said.